Fireplaces can be warm, cozy and romantic, but they can also destroy your home, your belongings, and your family! Consider these tips and rules to ensure safe enjoyment of your fireplace. 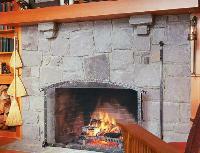 · Have your fireplace and chimney serviced annually by a certified chimney sweep. · Burn only hard woods such as oak or hickory. Soft woods like pine, lumber scraps, etc., do not burn as hot, leaving soot and combustibles on the chimney lining. This can cause a chimney fire. · Never use a flammable or combustible liquid to start or accelerate a fire. · Make sure a screen or glass door covers the opening. Sparks will shoot out of the fire box and cause a fire. · Be totally certain that the fireplace assembly is in good structural condition. No voids, cracks, or openings in the chimney can be accepted. · Clean ashes out of firebox prior to use, making sure there are no hidden embers. Use only metal containers with a properly fitted lid to store the ashes. · Dispose of cold ashes in the proper manner. · Be sure the damper is operating the way it is supposed to operate. · When installing/replacing the doors on the front of a pre-fabricated fireplace, check that the proper doors listed for that fire place are used. Numerous fires have occurred from installing improper doors, causing an excess of heat build-up and resulting in a fire in the wall behind and above the fireplace. · Never close the doors while the fire is freely burning, rather allow the fire to bank down before closing the doors. · Most important – BE CAREFUL! Having a fireplace can be a source of enjoyment, atmosphere, and extra heat. Building a safe fire requires attention to some details. 1. Before you start your fire, make sure the room is well ventilated. The fireplace damper must be open. To build the fire, place two logs on the grate or on the iron legs several inches apart. Lay tinder or crumpled scrap paper between them. Place a handful of thin or spilt softwood kindling atop the paper. Place sticks about 2 inches in diameter over the base, crisscross them to provide air spaces and draft between. Light the tinder or paper with a long match or paper. 2. When the sticks are burning, add a third, larger log. Add new logs as needed. Rake coals and ashes to the front of the grate or fireplace after each use. The ash should be allowed to accumulate to a depth of one or two inches, because it concentrates the heat and directs the draft up to the base of the fire. If a screen is attached to the fireplace, make sure it is closed. If there is no enclosure, a sturdy, fine mesh screen in front of the fireplace will help catch any flying brands or sparks. A fire extinguisher should be stored nearby. 3. Avoid building fires entirely of soft woods because they burn too quickly. Combining hardwoods such as birch, oak, or maple with the softwoods will make the fire easily ignitable and long-lasting. 4. If you use synthetic logs, read and follow the directions on the label. Plastics, scrap lumber, cardboard, or other refuse should never be burned. To extinguish the fire, use fire tongs to stand partially burned logs on end in the corners of the fireplace. Never close the damper while the wood is smoldering or burning. Keep the screen pulled or the doors closed until the fire is out.